aroma will see you through winter. it’s yours. You’ve claimed it. Once you name it enemy, you devote your life to it. Once you name it friend, it will forgive you. Once you name it love, you begin not to know. Name it blood, & you see how you’re related. or a mouthful of snow. the little plots we’ve left. just got an oil change. ready to roll, all pumped up. quick as the leash-clip snaps off his collar. The way the tanager circles above sunbathers. a medieval mace, a weapon against breath. of our own steps too much to take. toward the center, the sacred. of a wild, braided river. mongoose darted nest to nest. “Once You Name It,” “Gravity,” “Decisive Victory,” and “Braided River” are reprinted from Wings Moist from the Other World, University of Pittsburgh Press, 1994. “Taproots” is reprinted from The Circle of Totems, University of Pittsburgh Press, 1988. “July on the Chena,” “Polished Table,” and “Gnawed Bones” are reprinted from Gnawed Bones, Red Hen Press, 2010. “Basilisk Lizard” and “Sloth” are reprinted from Toucan Nest: Poems of Costa Rica, Red Hen Press, 2013. Peggy Shumaker's new and selected volume of poems Cairn will be published by Red Hen Press in 2018. She was honored by the Rasmuson Foundation with its Distinguished Artist Award, and by the National Endowment on the Arts with a fellowship in poetry. She served as Alaska State Writer Laureate. Shumaker is the author of eight books of poetry. Her lyrical memoir is Just Breathe Normally. 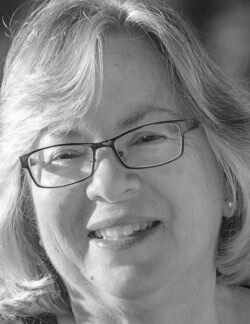 Professor emerita from University of Alaska, Fairbanks, Shumaker teaches in the Rainier Writing Workshop MFA at Pacific Lutheran University. She serves on the Advisory Board for Storyknife, and on the board of the Alaska Arts and Culture Foundation. Shumaker is editor of the Boreal Books series (an imprint of Red Hen Press), editor of the Alaska Literary Series at University of Alaska Press, contributing editor for Alaska Quarterly Review, and poetry editor for Persimmon Tree. Please visit her website at www.peggyshumaker.com. View More: Next piece "Alison Saar Swings Low in Harlem: The Harriet Tubman Memorial", Home, Archive. Thanks for these poems. I love the interplay of animal lives with human life and the close observation that makes meaning of both. Rich and lavish, the tales and tails and trails of these poems. I am quenched. I LOVE THIS JOURNAL. I love the poems of Peggy Shumaker.